Professionals in the on-site power industry are tuning in to the fuel quality challenges that have arrived with ultra low sulfur diesel fuel (ULSD) as well as the essential strategies for protecting power generation sites from fuel-related threats. It was my privilege to deliver a presentation on fuel quality challenges and opportunities at the EGSA Fall Conference in Sacramento in September. The professionals in attendance seemed eager to learn about ULSD and how to manage the challenges that it presents. In follow-up discussions I have fielded many questions and heard a lot of stories about different fuel-related concerns and problems. It is exciting and satisfying to help service professionals learn more about fuel and develop profitable business practices that enhance their client relationships. The EPA conducted research on 42 underground tanks storing diesel fuel and found that 83 percent exhibited moderate or severe corrosion of metal components inside the tank system. It also found that only 25 percent of the owners of those tanks were aware that they had a problem. The EPA report confirmed what previous studies have shown: ULSD has substantially different fuel chemistry compared to the higher-sulfur fuels that we used to store for on-site power. Today’s diesel is pushed hard during refining to increase the yield and remove the sulfur. It undergoes catalytic cracking and hydro-desulfurization. It is transferred repeatedly as it travels from the refinery to the storage tank, and each transfer can introduce contaminants such as ethanol and microorganisms. While the EPA stopped short of explaining the causation between specific fuel contamination issues and the problems it found in tanks and equipment, the report left no doubt that proactive steps are essential to prevent premature failure of fuel storage vessels, metal tank components and fuel metering systems. In addition to the contamination issues, ULSD also brings an increased risk of filter plugging, due largely to the fallout of particulates from the fuel and the build-up and/or release of sediments. These problems occur more frequently now, because ULSD has a greater affinity for moisture, and it carries water along for the ride. Water collects on fuel-wetted surfaces and serves as the electrolyte that allows corrosion to take place. Water also provides a habitat for microorganisms. Fuel tanks are better environments for microbes to grow now, because there is less sulfur, which used to act as a natural microbe inhibitor in diesel. The fuel also has reduced lubricity compared to high-sulfur diesel. Another set of complications comes with the biodiesel that is blended into many diesel loads. Biodiesel is an excellent drop-in fuel that improves diesel’s environmental profile and can improve the price, but it also make the fuel more complex and less stable in storage, which increases the need for effective fuel quality management. 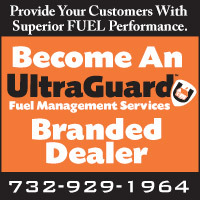 Regularly monitor fuel, and remove any water that is present in storage tanks. Send fuel samples to a fuels laboratory as a matter of routine to test for stability, water, particulate, microbial life, and organic/inorganic contamination. Use additives that include film-forming amines that inhibit corrosion; an anti-microbial (dual phase); a demulsifier; and an organic dispersant. Make sure all these components are totally fuel soluble.Filter the fuel and clean the tanks. Housekeeping is more important than ever before. Fuel Management Services has been addressing diesel issues for over 60 years, and it has never been more important than now to start a preventative maintenance program to limit corrosion in tanks and components and minimize other fuel quality issues. The industry is becoming more aware of this topic and now is the perfect opportunity to start educating your customers and employees on the issues we have been seeing. 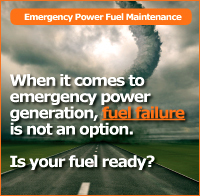 Offer better protection, and reassure your customers that with your help their emergency generator will not shut down at a critical time.